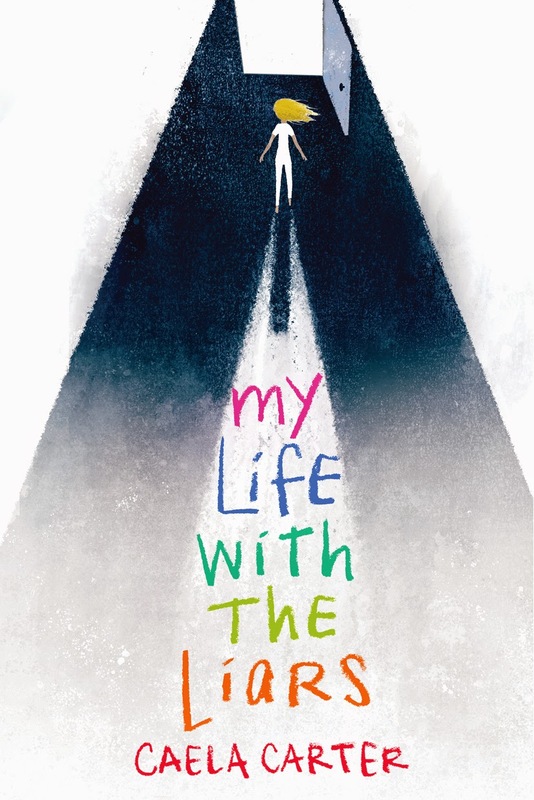 We're so excited to welcome Caela Carter to Kidliterati to share her reveal for the cover of My Life With the Liars, her debut middle grade novel out next year with HarperCollins. Caela is also the author of young adult novels Me, Him, Them and It, My Best Friend, Maybe and the forthcoming Tumbling. Gah! That crayon is THE BEST!! Behind the white-washed walls of the Compound, life was simple. Follow the rules, live in the Light, and all would be well. But on the Outside things are different. There are colors and toys and food. There are Liars and Darkness. And twelve-year-old Zylynn now faces a difficult decision—to stay here with the enemy, or find her way back to the Light. And neither may be what they seem. The glass doors slide open like magic and we step onto the bright white tile. I feel my pulse slow inside my skin. There are people everywhere, walking in all directions between the piles and piles of stuff in front of us. The people are pushing little carts, talking constantly like they don’t know where they’re going or what they’re doing or how they’re supposed to use their voices. There are some white walkways lining the place like guiding paths and between them there’s nothing but stuff. Rows and piles, mountains and pits, shelves and buckets of stuff. Who needs all this stuff? Who are all these people? I stand still as a stone with the artificial air freezing my skin and the sliding doors swishing back and forth behind me as more people push past me into this strange building. My eyes go wide, sucking it all in: the colors, the sounds, the smells. It’s overwhelming, but I’m calm. More calm than I’ve been in a while. Because over my head, miles and miles away, is a ceiling. And running along the ceiling, all over it from front to back and right to left and up to down are the brightest lights they have anywhere in Outside. I stay like that for so long—enjoying the lights in my pupils—that I don’t notice that Charita has left my side until she appears next to it again. She’s pushing one of the red carts herself now, like she’s one of the rest of these people. They have dead eyes and faces that zoom this way and that, looking, looking, looking at the stuff but thinking about nothing. “Who are all these people?” I ask her before it’s too late to stop my voice from coming. But that’s OK, actually, because I want to know. Are they from related compounds somehow? Do they say the same strange prayers that Elsie and Junior and Jakey say every night? How do they all know to come here, to Target? How do they all know what to do when they’re here? She says it with a question mark on the end, even though it’s an answer. I will never understand things here. This cover is awesome and the book sounds great!